Automakers around the globe produce millions of vehicles every year. The global rocket industry? It makes fewer than 100 per year that are capable of delivering satellites to orbit. But the way Jim Cantrell sees it, cars and rockets aren't all that different. And he wants his startup, Vector, to churn out rockets just as Ford churned out Model Ts. Cantrell — who was an early member of Elon Musk's SpaceX team — just hired some top brass away from the auto industry to help meet those bold production goals. Brian Barron spent more than two decades at BMW helping to fine tune the company's assembly lines. Vector said Thursday that he's joined the company as its vice president of manufacturing. "He's bringing his team along with him to put in place a manufacturing process at Vector to allow us to build hundreds, if not thousands, of [rockets] per year," Cantrell told CNNMoney. Vector is one of several young startups that are angling to become the next big thing in a new era of spaceflight, in which private companies, not just governments, are willing to take on the daunting costs and risks of space travel. Like his former employer, SpaceX, Cantrell wants to make trips to space cheaper and more frequent. But Cantrell doesn't think SpaceX's powerful rockets are going to give the satellite industry what it's hungry for: a small, inexpensive rocket that can fling tiny satellites into Low-Earth Orbit. SpaceX's bread and butter is putting hefty communications or military satellites into distant orbits. It also makes resupply trips to the International Space Station. The startup gets it done with its workhorse Falcon 9 rocket, a machine that stands 230 feet tall and can haul more than 50,000 pounds into space. What's revolutionary about the Falcon 9 is its $62 million price point, which drastically undercut competing launch providers. SpaceX was able to cheapen its launches by developing a way to recapture, refurbish and refly its rockets. Some, including Cantrell, question how long there will be strong demand for hauling massive satellites into orbit. As technology has evolved, small satellites -— even devices about the size of a loaf of bread — are capable of doing far more than they once were. And Vector has designed its rockets with those miniature satellites in mind. Standing at just 40 feet tall, the Vector-R is able to lift just 146 pounds into orbit. 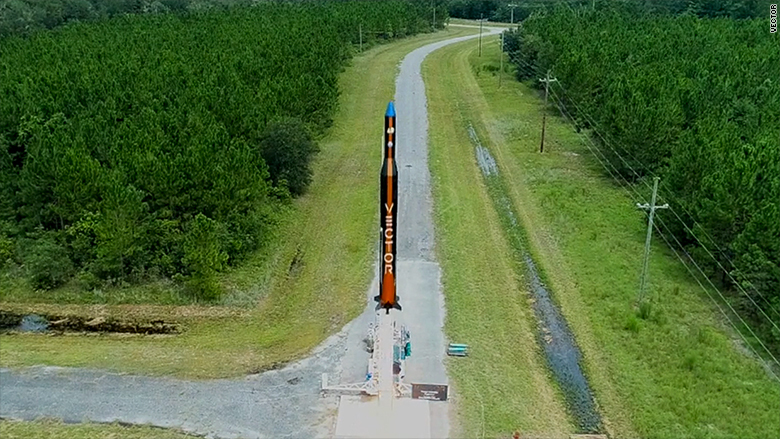 And Vector aims to set the price extremely cheap: between $1.5 million and $2 million per launch. Vector isn't interested in reusing rocket parts to reach that price point. Instead, they're looking to scale up production massively (think "economies of scale"). The Vector team is based in Tucson, Arizona, where Cantrell just opened the doors to a new 40,000 square-foot facility. He also hopes to start pouring the concrete on another 100,000 square-foot plant and grow his roster of employees from about 100 to more than 200 people by the end of the year. And though he draws comparisons to the Ford Model T, Vector says its assembly lines will include high-tech manufacturing techniques, such as 3D printing. Rockets have never been produced at the rates that Cantrell is proposing, but he's undeterred. "They're actually a lot simpler than cars," he said. Only time will tell if Vector can actually reach its goal. The startup certainly has brainpower with its roster of veteran rocket engineers. It also has competition. Billionaire Richard Branson's Virgin Orbit is gearing up to make a play at the small satellite market using its air-launched rocket, called LauncherOne. And another new company, called Rocket Lab, sent one of its its lightweight Electron rockets into orbit for the first time in January. Vector has yet to reach that milestone. Its first orbital launch is slated for July. Nonetheless, Vector has inked launch contracts with a few customers already. Open Cosmos, a nanosatellite manufacturer whose products are used for communications and research, has signed up for five Vector-R launches. And the Virginia Commercial Space Flight Authority has a deal for three launches.